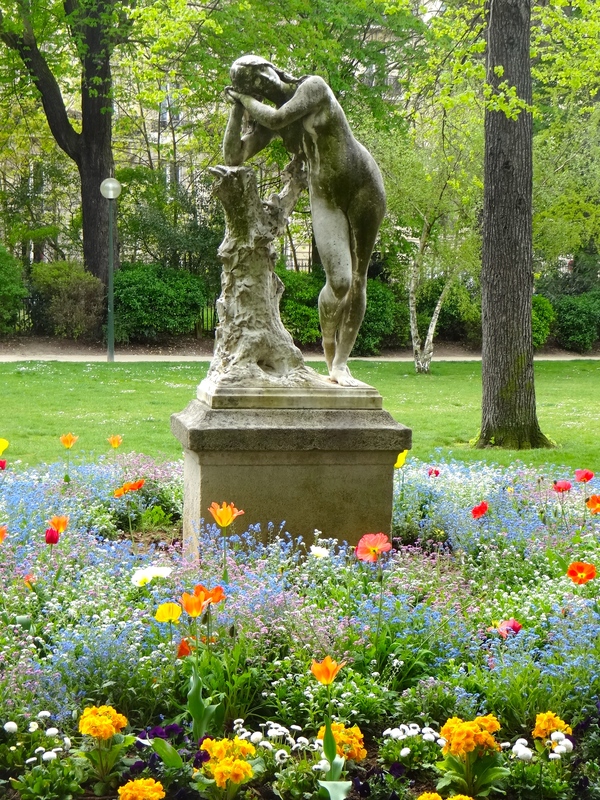 On a beautifully warm spring day, we decide to walk the short distance from our flat through the Jardins du Ranelagh to the Musée Marmottan Monet. 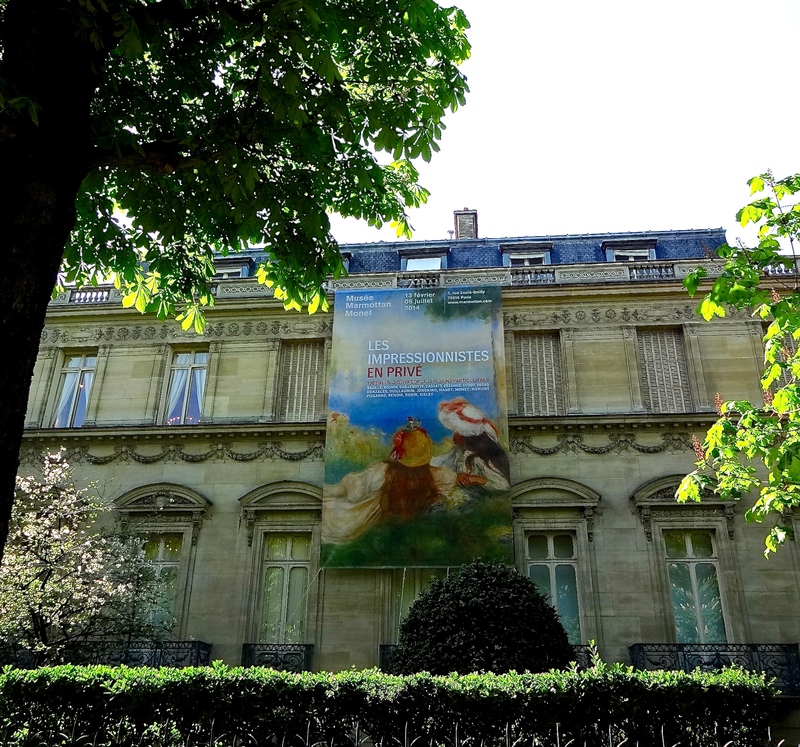 Thanks to a bequest by Michel Monet, the painter’s son, this Museum houses the largest Claude Monet collection in the world. As we near the park’s entrance, we are suddenly swarmed by a large group of children in yellow t-shirts emblazoned with their school name. Flanked by adults, they move quickly past in a wave of chatter and laughter. It seems they are on their way to a respite from words and books to feed their soul on the beauty of the Impressionists. Even though the queue extends down the block, we assume it will move quickly since the Museum is just opening. This small, out-of-the-way Museum is clearly more popular than expected. As luck would have it, through 6 July, the Marmottan is exhibiting 100 Impressionist masterpieces from 50 private collectors. 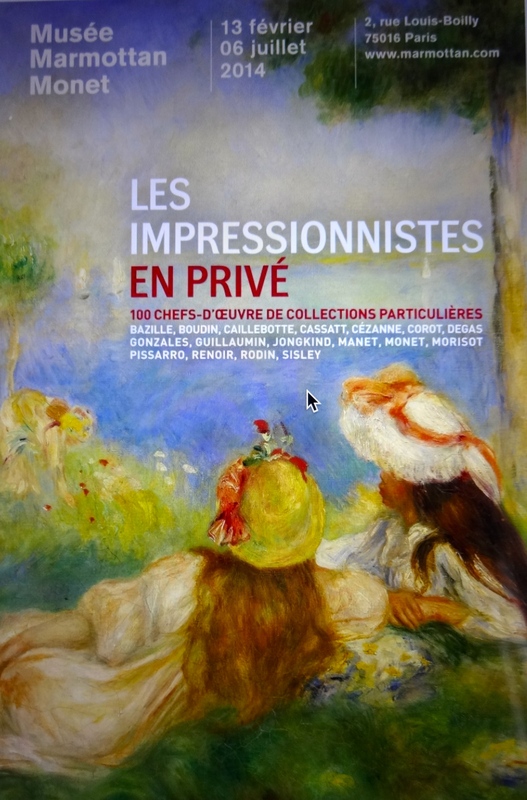 Titled Les Impressionnistes en privé, the exhibit includes quite a few of my favorites artists, including Pierre-Auguste Renoir, Édouard Manet, Alfred Sisley, Berthe Morisot and Camille Pissarro. A sizable display and a very rare one indeed! 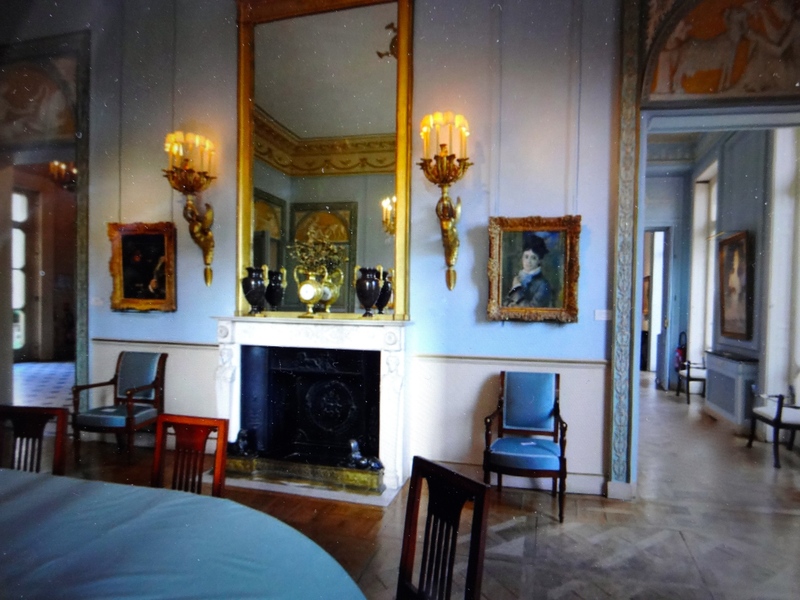 Entering the Museum, we move into what appears to be a dining room, where we are presented with antique sideboards and tables with lovely sculptures and chandeliers. Artwork adorns the walls and through the audio guide, we are introduced to the Marmottan, a bit of its history and that of the artists. We move into the hallway housing the current exhibit, which begins with early works from 1870, including landscapes by Corot and Eugène Boudin. The exhibit moves through to the mid-1890s and includes pieces spanning the careers of each of the artists represented. As we move down the stairs and into the Museum’s permanent collection, we see the school children sitting on the floor in front of the astonishingly beautiful Impression, Sunrise, which is said to be what identified this style and thus began the Impressionist movement. The antique gold frame and the lighting add to the allure and make this a truly striking piece (the photo below does not do it justice). The children are enraptured, listening intently to a very energetic docent. Presumably, she is telling the tale of how Monet exhibited this painting in 1874 during the first independent art show of the Impressionists (although that’s not what they were called yet). In a hostile review of the show and inspired by the painting’s name, art critic Louis Leroy used the headline, “The Exhibition of the Impressionists,” thus inadvertently naming the new art movement (much to his surprise, I’m sure). While I tend to gravitate to Renoirs, I am easily enraptured by the beauty of Monet’s more subtle pieces. In particular, his paintings of London, which tend to capture the muted colors and fog-enshrouded city. On close inspection, you can easily see his unique and signature short and loose brush strokes. Stepping back, the detail is surprisingly enhanced and if you gaze long enough, you can almost picture yourself walking along the streets just outside the Houses of Parliament or standing on the Charing Cross Bridge, the mist swirling about. Among the better-known of the Impressionists, Claude Monet’s most famous series are of his beloved water gardens at Giverney. Monet’s Water Lilies line the walls and a round room in the lower level of the Marmatton. The number and variety is quite impressive. The colors and hues show the changes during the six year period that Monet painted his 48 water landscapes, all bearing the same name. 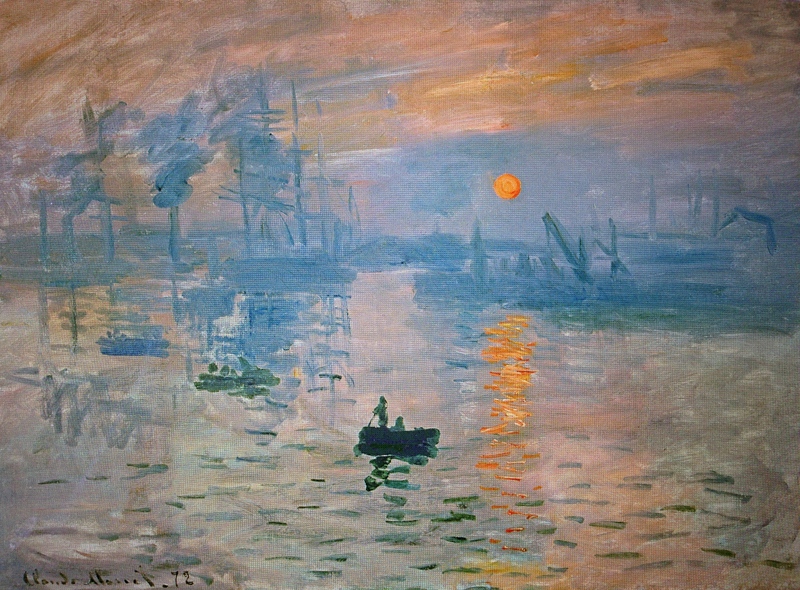 With this series, Monet once again broke with convention, presenting a new type of landscape 35 years after Impression, Sunrise. It’s easy to get lost in the unfettered landscapes of water with his lilies floating across his canvases, edge-to-edge. The Museum is a delight, and larger than we initially assumed, with some amazing pieces in the permanent collection. I was very happy to discover this gem and it has now been added as a Paris favorite, along with another of my favorites, the Musée d’Orsay. 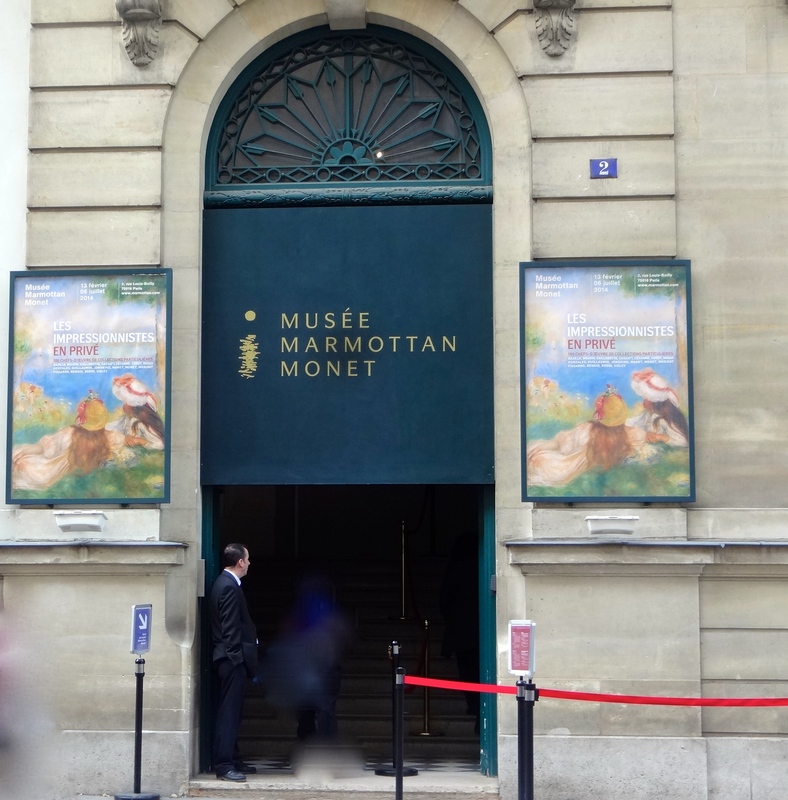 This entry was posted in Paris, Travel and tagged Claude Monet, Giverney, Impression Sunrise, Impressionists, Jardins du Ranelagh, Musée d'Orsay, Musée Marmottan Monet, Paris museums, Water lilies. It is indeed a fabulous museum. Spent 4 days in the Loire Valley with Dolores. Got back yesterday. It was lovely and yes, time is flying by!